Wooden throne found in the antechamber of Tutankhamens treasure house. One of the most beautiful objects from the kings tomb is the wooden throne with lions heads supports, overlaid with gold, silver, semiprecious stones, and glass paste. Although Tutankhamen presided over the obliteration of his predecessors heretical Aten worship, the exquisite back panel of this throne could have been designed for Akhenaten himself. 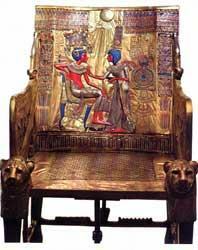 It shows Tutankhamen seated on a cushioned chair, attended by his wife. In the rear, the sun disk showers beneficent rays upon the royal pair.